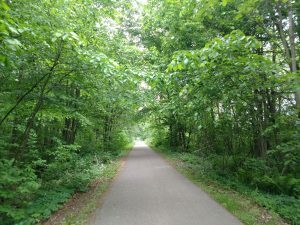 I was excited to try out the Macomb Orchard Trail again. It had been a number of years since I had been on the trail and it is now completely connected from Richmond in the east to just north of Yates Cider Mill at 24 Mile and Dequindre in the west. 26 Miles. So fun! But where to start? Enter Keith Lesperance from Armada. Keith’s family business, LPC Group (formerly Lee Printing) is a branding and marketing company located on the border of Mt. Clemens and Clinton Township. He is an Iron Man competitor, marathon runner, all around top athlete, and frequent visitor to the Macomb Orchard Trail. Matt Casey, attorney with Warner, Norcross & Judd (and Advancing Macomb board member) introduced me to Keith to get him involved in our social club – The Advancing Macomb Trustees. In our introduction, Keith talked about the history of his business and how he loved living in Armada, in part, because of the easy access to the Macomb Orchard Trail. Since I had not been on the trail in years, he invited to reintroduce me to the MOTC. Fast forward to late spring of this year. 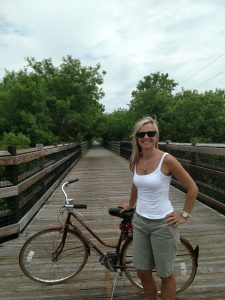 Our planned cycling day turned out to be an overcast day somewhere in the 70 degree range. Perfect weather for miles and miles of biking. Let me set the stage…. About ¾ of the way to Romeo, you come upon a wood slat bridge overlooking the Clinton River and a beautiful farm pasture. It was a perfect resting spot – and photo op! Moving on, we crossed over the Van Dyke freeway and through the iconic barn-themed covered bridge. As you cross various markers on the trail, there are handy trail maps with key identifiers for restrooms, park and picnic facilities, points of interest, and road intersections to exit the trail. The trail winds through several communities that offer fun and helpful stops. In Romeo, there is a grocery store and shopping center less than a quarter mile off of the trail. 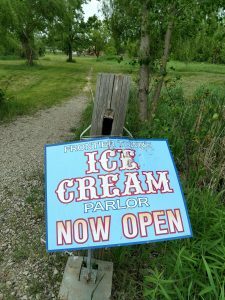 Near Romeo, on the north side of the trail, you will find Frontier Town, which features an Ice Cream Parlor (and a beauty salon if you need one). 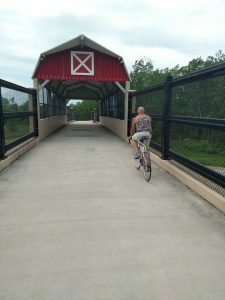 The charm of the trail isn’t just the beauty and access to the historic farming communities in northern Macomb County. It’s also the local pride that is displayed along the entire length of the trail. A number of sponsors have signs indicating their annual commitment to cleaning and tidying their portion of the trail. Keith and his company have their sign proudly displayed just on the other side of the Van Dyke freeway. There were others from local 4H clubs, the MA2S First Robotics Team, and a local manufacturing company. We had so much fun that after we turned around, we went past our starting point and headed toward Richmond. Richmond had just re-done their trailhead and I was dying to see it! Alas, time did not allow and we had to turn back. Perhaps my time constraint was just a little incentive to make sure I come back for another ride and another opportunity for many new discoveries.